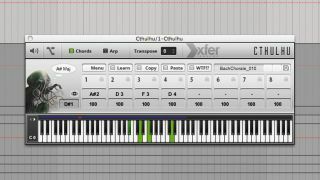 Xfer Records' Cthulhu can help you to come up with musical ideas. While there's no replacement for a solid knowledge of music theory, 'chord generator' plug-ins are fantastic for starting off a track idea or musical progression, especially when time is tight. Load one before a synth, fire up an interesting patch, and find something that hits the right notes. We're using Xfer Records' Cthulhu - a tool jam-packed with both preset chord progressions and detailed programming features. After finding a suitable sequence of chords, we've recorded the effect's output to a new MIDI region, rendering the notes as you would bounce an audio signal. By doing this, you can easily alter individual notes, duplicate the part over to other tracks in a project, then create accompaniments in a flash. Again, take a listen through the audio examples for each step, found with this month's download/DVD content. You'll hear the initial preset chord sequence, our note adjustments, then further musical developments. Step 1: To begin, we've loaded Xfer Records' Cthulhu on a MIDI track, then routed its track's output to the MIDI input of a software instrument. After selecting one of the preset progressions, a string ensemble sequence is arranged using only single MIDI notes. Step 2: The third chord in the sequence could do with a little adjustment, so we record Cthulhu's output to a new MIDI region, printing our chord sequence to its own new MIDI file. We now adjust the notes of this chord to better suit the progression. Step 3: The corrected MIDI file is now duplicated to a new instrument channel, and a second part is layered over the first. It's a washy, evolving synth pad from Sylenth1, adding melodic character and movement over the static string chords for thickness and interest. Step 4: Our MIDI progression is duplicated to a third MIDI channel, and we delete the majority of chord notes to create a monophonic bass part. Rob Papen's SubBoomBass is used to generate a weighty Reese bass, underpinning the other chord elements for solidity in the low-end. Step 5: For an interesting arpeggiated riff, we return to our original Cthulhu channel and route its output to a new MIDI channel containing an instance of Synapse Audio's Dune 2 synth. Cthulhu's flexible arpeggiator generates a fast riff sequence from our original chord progression. Step 6: The arpeggiated notes are too predictable, so we delve into Cthulhu to add variation to the pattern. Steps are shortened via the Gate section, injecting rests into our synth sequence. We can again print Cthulhu's output to a new MIDI region for more detailed MIDI adjustments.